i intended to write about the delicious mushroom and farro pie that i made days ago, but smitten kitchen beat me to it. it almost never happened, me making this pie. then it happened that i made it twice in two weeks. what was supposed to happen was, i was to create a complete sri lankan dinner party spread for 6 of my partner’s friends and their others, at our first big dinner party in our new house. what actually happened was that i totally chickened out before i even thought about that idea for too long, and opted to make something from a recipe instead. that says something about how spooked i was. aside from my family’s recipes, which i follow with a mix of equal parts insecurity and distrust, i hardly ever use a recipe when cooking. don’t get me wrong, i have nothing against recipes or cooking from them. in fact, i cherish published recipes in tv, book or magazine form like an addict. but even if inspired by what i’ve seen or read, i hardly turn to recipes to create a dish. those recipes of my mother’s and my aunt’s are for my favourite sri lankan dishes that i know i can make. i know because i’ve made them alongside them, during steph-by-step tutorials. but my familiarity with the spices is weak and i don’t know how to tweak them to get just the right flavour. and rather than fail, i run. i ran to gourmet magazine’s november issue, and the coverline promising “the ultimate vegetarian thanksgiving” received me like a warm, embrace of avoidance. here, in this fabulous mushroom pie, was the answer. a vegetarian entree that looked worthy of a dinner party, that required a recipe in my mind, since it involved dough, and the only thing that scares me more than cooking my family’s recipes is baking. so you can guess that the pie was sufficiently delicious. i enjoyed it both pre- (as seen above) and during-dinner party. served with a green salad with a french-style vinaigrette, and a fennel gratin, the dinner was a success. everyone especially enjoyed the trio of savoury, sri lankan baked appetizers and sambol that my family made for my party…which they committed to in the excitement of me announcing that i was creating a sri lankan feast for friends… soon. soon. Cover farro with cold water in a bowl and soak30 minutes, then drain in a colander, discarding soaking water. Bring farro, water (3 cups), and 1/4 teaspoon salt to a boil in a medium saucepan, then reduce heat and simmer, uncovered, until tender, 15 to 20 minutes. Drain. While farro cooks, melt butter with oil in a 12-inch heavy skillet over medium-high heat, then cook garlic and half of scallions, stirring frequently, 2 to 3 minutes. Add mushrooms, 1 teaspoon salt, and 1/2 teaspoon pepper and cook, stirring occasionally, until just softened, about 5 minutes. Add Madeira and simmer 1 minute. Transfer to a bowl and stir in farro, then cool completely. If pastry is in 1 piece, cut into 2 equal pieces. Roll out each piece on a lightly floured surface into an 11-inch square. Stack squares on a parchment-paper-lined baking sheet with a second sheet of parchment between them, then cover with plastic wrap and chill at least 30 minutes. of oven and preheat oven to 400°F. Set aside top square of pastry on parchment. Spread cooled filling evenly over pastry on baking sheet, leaving a 1-inch border. Brush border with some of egg wash, and, using parchment, invert second square on top, lightly pressing to seal border. Brush top with remaining egg wash, then crimp border with a fork and trim with a pizza wheel or sharp knife. Cut a few small steam vents in top of pie and decoratively score pastry. Slide pie on parchment onto preheated baking sheet in oven and bake until puffed and deep golden brown, about 45 minutes. •If using barley, simmer unsoaked barley in 6 cups water with 1/4 teaspoon salt for 45 minutes. •Filling can be made and pastry rolled out 1 day ahead and chilled. 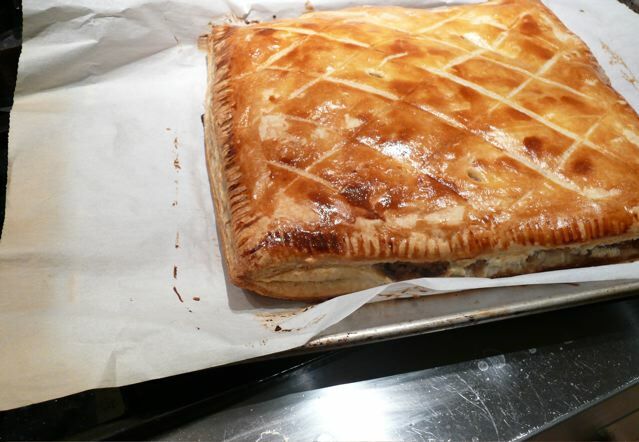 •Pie can be assembled 3 hours ahead and chilled, uncovered. my note: in the comments on smitten, people tried to offer solutions for a blandedness that was suggested. I admit, though warm, delicious and satisfying, it didn’t zing. Next time, I’ll be using a creamy blu cheese or chopped dried figs or both to round out the flavour.